Our Large Food Keepers are an exceptional option for storing leftovers and dry goods, and as a large food storage container appropriate for even watermelon halves and full bunches of celery. The ultra-clear polypropylene bases feature flexible airtight lids. Our Small Food Keepers offer more coordinating food storage options. 2.1 qt. Food Keeper 2.0 lt.
2.22 qt. Food Keeper 2.1 ltr. 4.23 qt. Food Keeper 4 ltr. Our On-The-Go Container from OXO will change the way you take your food to-go! The container has two leak-proof compartments, and one removable leak-proof dressing container to keep wet and dry ingredients separate and fresh. Plus, the durable lid features four locking tabs to ensure a secure seal! Lustroware Large Food Keepers is rated 4.5 out of 5 by 93. Rated 5 out of 5 by Swinsty from Love these containers! I get the itty bitty ones to put snacks in, and they're great. Easy on the hands and seals in all the freshness. Win! Win! Rated 5 out of 5 by Fjvigil5423 from Excellent container for storing my fasteners I created a great nut and bolt and fastener collection to take with my on the go. Rated 1 out of 5 by Sassydezines from Lid does not stay on The bottom or bowl seems to be a good product but I can't keep the lid on so the lid is going directly into the trash. Will never buy a KEEPER product again. Rated 5 out of 5 by Sonj from Spices I have a small kitchen with three tiny drawers. These 4 and some 9 ounce now store my spices to save on space. They stack well so that I can have 30 of these take up minimal space in my cabinets. I included a photo of a few of them before I finished the whole project. Most of my spices are in the four ounce but I had to wait to get some shipped to the store. Rated 5 out of 5 by pagosahiker from Just what I needed I bought several of these boxes, in the 4 liter size, to freeze homemade bread and stop using so many plastic bags. One of the best features of these boxes is that the lid remains soft even straight from the freezer, making it easy to remove. Rated 5 out of 5 by MWhite1 from These are perfect sized to store bags of flour and sugar. There is usually a little flour left from a 5 lb. bag but it's about the amount I'm about to use for what I'm making so it's not a big deal for me. Rated 4 out of 5 by MDC1 from dog food containers I purchased these for home made dog food. It is difficult to find this dimension of food container, therefore I purchased twice as many needed. There are 2 drawbacks. The biggest one that I did not realize until I recieved the containers is, they do not stack one inside the other (without lids) for compact storage. The second was stated on the website, lid are not dishwasher safe and need to be hand washed. Rated 5 out of 5 by Jevannasky from Perfect for cookies! I bake a lot during the holidays and these containers are perfect for storing all the sweets that can't be stacked. I own about five of them and they are used quite often. I have put them in the freezer as well with no issues which is why I am perplexed by the other comments about the lids not fitting. I have not experienced that problem. My lids all fit perfectly. Rated 2 out of 5 by branmo from Lid doesnt fit I like the container and I'd have plenty of uses for it ...if the lid would stay closed. Waste of money. Rated 1 out of 5 by Maritha from Lids don't fit These are a very nice size for what I needed--to store single layers of trout in the freezer, asparagus, etc. However the lids do not fit after running them through the dishwasher once--top rack. They are warped and too small for the containers now. The description claims the containers are top rack dishwasher safe which is why I bought them. Rated 1 out of 5 by aapatel1 from Do not purchase! The lid does not close properly. When one side is pressed down and secured, another corner pops up. Rated 5 out of 5 by Bethybug from Perfect I wanted a container to carry Humus in for work. I was having trouble finding one with wide mouth but not too deep. This is perfect. I also used it for carrying pills on a trip. Double duty purchase! Rated 5 out of 5 by AmyLou from Wonderful addition to my kitchen I love these round food keepers. Especially the little one which is perfect for snacks like trail mix, etc to take on the go! Rated 4 out of 5 by stormrider from Great little containers I love the smaller containers for carrying snacks like nuts, carrots, etc to work! Sturdy and easy to clean. Rated 5 out of 5 by Emmalimabean from Great for sandwiches and a veggie/fruit! Excellent replacement for a sandwich baggie! Very durable, easy to clean, and the divider moves easily and helps keep your veggie/fruit choice away from the sandwich. I haven't tried anything too watery to see if it spreads under the divider, but so far, great product. Rated 5 out of 5 by BoraBoraMom from Great brownie container Great container to store leftover brownies. Stacks just one high, so they don't stick together. I'm sure there are other uses too, like decorated cookies, so they don't get messed up. Rated 5 out of 5 by Rock23L from Not Just for Food I use these containers for everything; extra outlet plugs, crafts and especially my seashell collection. They keep my mini shells nice and organized. I have had some of them for years, very durable! Rated 4 out of 5 by Nolamomma90 from Food Keepers ( Round) Great for storing sugar, flours, oatmeal, noodles. Rated 3 out of 5 by Mack from Soft lids get too soft over time I got these four years ago because they have the easiest lids to open for a preschooler. The soft lid is easy for a young child to pry open. Other containers (snapping, screwing, or simply squeezing on) were too hard for her. HOWEVER, four years on, the lids are now TOO soft. I often put fruit in these containers, which very slightly ferment as they warm towards lunchtime. This fermenting pops open the lids and fruit juice (which has drained a bit from the now-warm fruit) spills all over. I circumvent this problem with a rubber band around the container. With another preschooler stepping up, though, I'm not sure how he will handle the rubber band, so I am looking for other solutions for him. Rated 4 out of 5 by Cate108 from Handy Container Stores baking supplies. Spoon is a nice addition and fits without taking up additional space. Rated 4 out of 5 by Csb911 from good for chips I use this one for packing chips for my son's lunch. Rated 4 out of 5 by Csb911 from Great for snacks It works very well for the cereal I pack for my son. Rated 5 out of 5 by LauraEllen from Outstanding for Use in RVs I love all the rectangular containers in this line of storage containers. 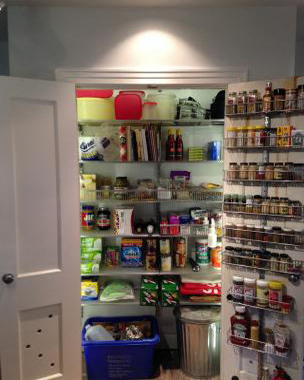 The shapes fit snugly and stack conveniently in our small RV-sized refrigerator and cabinets. The lids seal so well that food stays fresh, and even if it tips over or falls out of a cabinet or fridge while RV is moving, the lid won't come off and contents will not spill. Rated 5 out of 5 by Hope85 from Lush storage I love these containers. I was looking for storage for my Lush bath products. They needed to be completely clear and air tight. These containers are perfect. I like that they have all different sizes and they fit perfectly in my drawers. Rated 5 out of 5 by missnative from handy little containers I first purchased these little containers several years ago. They were great then for keeping my toddlers snacks and still work great now for my grown ten year olds school lunch snacks. I love the easy to open lids and the fact that they are a safe plastic to use for my family. I will definitely buy more in the near future. Rated 5 out of 5 by MommyJB from small food keepers I got a couple for my child's lunch box. They keep the food from spilling, and they are much easier for her to open than some of the others I've tried. We will get more. Rated 5 out of 5 by Organizedlady50 from Fits Great In Cabinet This slim container holds Arnold's Sandwich Thins perfectly and fits nicely in our pantry without taking much space. Rated 5 out of 5 by damas from AWESOME storage keepers These storage keepers keep food items fresh and are easy to manage opening and closing. MY FAVORITE!! They are the perfect size for small amounts and for food storage that gets smaller as the family eats leftovers. Rated 5 out of 5 by rkvaron from kids lunch life saver I use these everyday to pack my kids' lunches. they work great and the kids can open them. i like how snugly the tops fit so that there are never leaks. I recently purchased two of these containers assuming Container Store only carries BPA-free food storage products. A few days later, I noticed all the Japanese fine-print on the bottom of each container and am concerned now that maybe they aren&rsquo;t BPA-free. I believe they are BPA-free, but I no longer have the packaging that might have stated that. can I nest the same size together? my favorite ones nest but are round and take up more room in the fridge. No, mine do not stack one inside the other without lids. They take up space when being stored empty. The plus to the square in the fridge, is they nestle uptight to each container. It looks like there are two boxes. Do they come as a set, or can they be ordered separately? Please provide the dimensions. Thank you. Inside (useable) dimensions are: 11 1/8 x 8 1/2 x 1 1/2 inches. We don't offer a size in between the measurements mentioned for this particular product, but we do offer it in the Oblong Tellfresh realseal containers, sku # 10058898 with a range starting from 16.9 oz to 4.2 qt. The 30.4 oz would be the closest between the measurements you listed. What size is the spoon? The spoon included with our Handled Keeper has approximately a tablespoon capacity. Is this the same container I bought before? I bought nine containers from you before and I want to buy several more but I can't tell if these are the same ones. On the lid, they say &quot;Keeper Flexible Sealware&quot; and on the bottom of the containers there is Japanese writing and the words &quot;Lustro Ware&quot; (Stock B-834). Are these the same ones I bought before? This is same product we&rsquo;ve carried for a long time...there have been updates to some of the labeling on the bottom but no changes to the product itself. Are the lids pressed-on or twist/screw-on? Thanks. Our Round Food Keepers feature press-on lids. The Handled Keeper &amp; Spoon has a flat top &amp; bottom so it can be stacked. The bottom is slightly smaller than the top so when stacked, it is not a tight fit; however, the top does have a lip to assist in stacking.